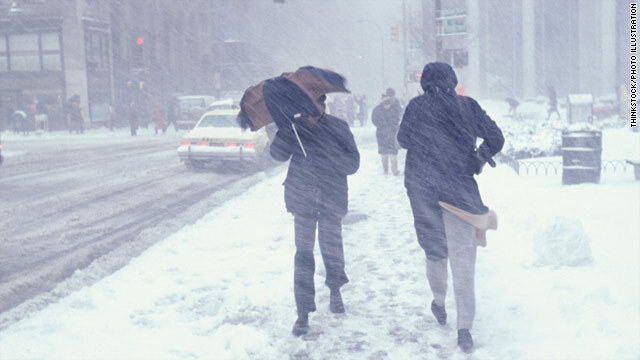 Blizzards can be even more trouble for some people with certain health conditions. (CNN) -- Robyn Nichols always knows when it's going to rain. She can feel it in her bones -- literally. Having lived with rheumatoid arthritis since she was 2 years old, Nichols, now 37, is able to sense a change in the weather up to two days before it happens. Even at a young age, she was something of a meteorologist. When her elementary school class began learning about the weather, one boy piped up, "Why don't we just ask Robyn? She can tell the weather with her knees." Despite some positives, like always knowing when to tote an umbrella, her sixth sense carries a price: painful joints and difficulty moving. A sudden shift in barometric pressure, or the weight of the air, is what causes joints to swell. This swelling is particularly painful for people who suffer from arthritis because of the amount of pressure and fluid in their joints, said Dr. Patience White, the Arthritis Foundation's vice president of public health. "It's a closed space," she said. "Joints are only so big ... and when what's in that space becomes inflamed, you feel it. ... Any increased fluid makes your range of motion less." Nichols, who lives in Wheaton, Illinois, about 40 minutes west of Chicago, is no stranger to the cold, but the blizzard that recently hit the Midwest left her homebound for days. "I've canceled plans throughout my life because of weather," she said. "I may not be able to get somewhere that another person would be able to. ... I just can't maneuver over 10-foot piles of snow covering the sidewalks." And the winter weather doesn't just have an effect on people with arthritis. Changes in barometric pressure cause pain for people who suffer from sinusitis, deep-vein thrombosis (blood clots) and migraines. Dr. Merle Diamond of the Diamond Headache Clinic in Chicago said more than half of her patients can predict the weather based on when they begin feeling pain. It begins with some facial pain, Diamond said, and pressure in their sinuses. Then they become light-sensitive. Diamond said she received more than 40 e-mails and 50 phone calls from concerned patients days before Chicago's recent winter storm, which dumped about 20 inches of snow on the city. In addition to the weather, other migraine triggers like anxiety and stress -- as in, "will I be able to get home tonight?" -- certainly didn't lessen people's headaches, she said. Though a patient's best option when faced with a weather-induced migraine might just be to weather the storm, so to speak, there are measures people can take when they feel a headache coming on. "Make sure you take care of other headache triggers," said Diamond, who also suffers from migraines. "Don't eat provocative trigger foods, like red wine, and don't skip meals. ... Sleeping regularly, good hydration and regular exercise are also important." Another victim of the Midwest's winter weather is Rich Kase, who lives in Cuyahoga Falls, Ohio, about 40 minutes south of Cleveland. A former college football player who banged up his knees quite badly, Kase, 58, is used to aches and pains. He says his unusually high threshold for pain helps him get through the winter months with osteoarthritis. "I don't load up (on ibuprofen) unless I know I'm going to be active," he said. "Just because the weather changes, I know I'm going to be tighter, and I know I'm going to be aching. If I bump my hand, it's excruciating." Many people who are negatively affected by changes in the weather believe that moving to a more constant climate will help lessen symptoms. Unfortunately, White said, it's not that simple. "It happens in Arizona, and it happens in Maine," she said. "People generally feel better in warmer temperatures, but the storms don't go away." However, Dr. John Nielsen-Gammon, a Texas state climatologist and professor of atmospheric sciences at Texas A&M, says certain regions are more favorable for people living with conditions like arthritis. Low-pressure systems follow the path of the jet stream that goes across the middle of the U.S., passing directly through Illinois, Nielsen-Gammon said. "It's very unusual for an intense low-pressure system to pass across Arizona (or New Mexico), which is protected by the mountains," he added. "And even in the summertime, the biggest changes, from hurricanes and tropical storms ... Arizona is far enough from major hurricane regions." Kase grew up in Ohio, but said he plans to retire somewhere warm -- possibly the Carolinas. "I love that climate," he said. "It truly helps (the pain). You can tell you're loosened up and more flexible. Your hands can move. You can bend your finger. And your knees don't ache as much." But for now, Kase is just trying to make it through the winter.